At Renaissance Exercise™, we maintain an unwavering dedication to engineering excellence and outstanding design. We adhere to the highest standards of developing exercise and rehabilitative equipment, and our hand-built machines exemplify the purest spirit of forward-thinking innovation. With the release of our generic line of equipment, we have pushed the envelope and pulled all the stops to develop high-performance machines that operate and feel like nothing else on the market. From exclusive, custom resistance profiles, to meticulous craftsmanship using the finest materials, to peerless design characteristics and biomechanics, these machines literally bring to life Ken Hutchins’ extraordinary protocol and philosophy. 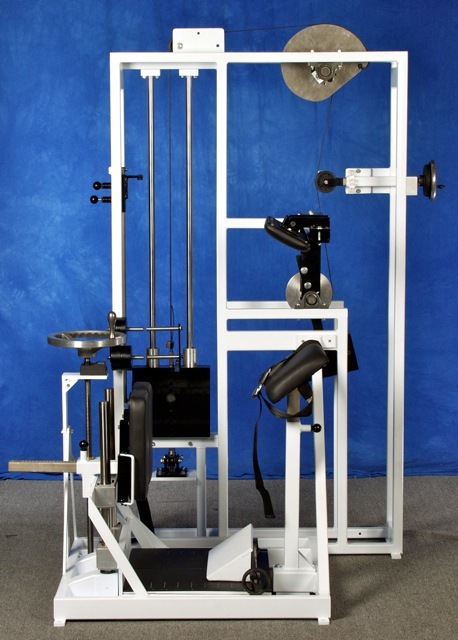 Now, the Renaissance Exercise team is proud to present a groundbreaking exercise machine that challenges many of the most revered notions of spinal exercise and rehabilitation, and demands a critical re-examination of the conventional wisdom. Introducing the RenEx Trunk Extension machine by Renaissance Exercise Equipment, Ltd. The RenEx Trunk Extension machine enables the user to perform a general posterior movement whereby the trunk, pelvis, and hips rotate collectively. The machine not only provides an intelligent and revolutionary restraint system that cleverly reduces more-common, aggressive restrictions, but also amazingly permits a greater comparative total excursion than any device from any manufacturer. It combines enhanced mechanical performance, advanced technologies for force measurement, and a radical, assertive design that provides a truly inimitable workout experience for the user. This is the evolution of strengthening exercise for the lumbar spine and beyond. Notwithstanding the elaborate engineering of the unique restraint system, the RenEx Trunk Extension machine’s function is remarkably simple, direct and intimate. By distilling the general idea of torso extension to its essence and amplifying every aspect of performance, Ken Hutchins has created the ultimate flagship machine for Renaissance Exercise Equipment, Ltd. Although there are similarities to existing lower-back machines, the RenEx Trunk Extension truly differs from all other machines that provide extension-type exercise. Other machines specifically attend to the hips or the pelvis, the lumbar spine or the thoracic spine. They may address one or two but never all four components collectively. By contrast, a subject exercising on the RenEx Trunk Extension produces movement through an anatomically collective focus, rather than a specific one. Instead of trying to physically block the contribution of the ancillary musculature, the RenEx Trunk Extension machine purposely encourages its recruitment by way of synergistic coupling. As a result, the user can experience a total range of motion with an astounding 122 degrees—more than any other machine has ever permitted—25 degrees of extension beyond anatomical neutral. In fact, extension therapies such as the McKensie Extension Method have been applied with very good outcomes and demonstrate that extension is a cure for a host of back conditions, such as sciatica. And in more serious conditions such as spondylolithesis, where the vertebral bodies can shift anterio-posteriorly with grave consequences, observation shows that extreme extension is relieving for many patients while extreme flexion actually increases instability and pain. Further, Hutchins has indicated that it was Arthur Jones himself who originally inspired the idea of a machine that permits greater extensional range of motion. Shortly before abandoning his work on the Nautilus Lower Back machine and starting MedX, Arthur suggested to Ken that the farther a human subject engages in extension, the greater the volitional decompression on the vertebral bodies. Yet despite Jones’ contention regarding extension, avoidance of hyperextension has been a hallmark characteristic of lower-back-type machines from large exercise equipment companies such as Nautilus, MedX, Cybex and others. Ironically, these same companies overlook the fact that their very own abdominal-machine designs passively push the trunk into hyperextension—a much more grievous affair. From 1986 to present, MedX has designed and marketed its machines for isolated lumbar dynamometry. These were the first effort-dependent systems for valid strength testing and specific rehabilitation of the lumbar spine. Some of these were made for measurement and exercise while some merely for exercise. MedX has scientifically substantiated the concept that the best way to correct spinal debility, weakness and pain is strength training, and it is clear that the MedX approach has helped many with back issues. But it is also probable that many back issues may be better served with the deletion of most of the constraint and movement restrictions incorporated into the MedX machines. The RenEx Trunk Extension machine represents an evolution in prior advances by machines like the Lumbar machine by MedX and the Nautilus Lower Back machine before it. It is the end result of collaborative and intense study, progressive discovery, and enduring dedication. The goal was to develop a machine that truly maximizes the potential for strengthening the entire trunk, including the lumbar, and addressing the limitations of existing equipment. As such, we are interested solely in exercise and not at all with isolated testing. Thanks to MedX’s published research, we have peer-reviewed evidence that strengthening exercise indeed corrects abnormal strength curves and resolves pain issues. In turn, this relieves us of the burden designing a machine for specific testing. Facilities for movement limitation, variable counter-weighting, stored-torque compensation, and tyrannically-restrictive constraint mechanisms are both unnecessary and undesirable. Instead, we have been free to focus exclusively on designing the best tool for complete torso extension, performed safely and without compromise. The RenEx Trunk Extension machine brings practices and principles from RenEx Equipment’s revolutionary generic line of equipment along with a host of radical designs and developments. A handcrafted steel frame forms the bold, ultra-rigid foundation of the machine with an offset segment that contains the elaborate styling of the drive train, pulleys, resistance delivery system, and movement arm. Protracting from the heart of the drive-train segment is the movement arm itself, which appropriately exceeds the range of motion of the torso. At the same time, it can be optionally stopped in fine-tuned increments or decrements to protect subjects with extensional as well as flexional limit issues. Just astern of the subject’s right shoulder, you’ll find the superbly cut, crank-adjustable, variable cam that accommodates subjects’ variable endpoint resistance decrease requirements. Ken’s proprietary cam design allows for the truest performance of the Renaissance Exercise protocol and provides the unique resistance variation that no other machine can provide. But it is the precision restraint system on the RenEx Trunk Extension that truly distinguishes the machine mechanically from any similar device. The system encourages the subject to feel and use the buttocks, the hamstrings (rear of the thighs), and the entire mid-section to properly enable true torso extension, which includes volitional spinal decompression of the lumbar area particularly in extension. 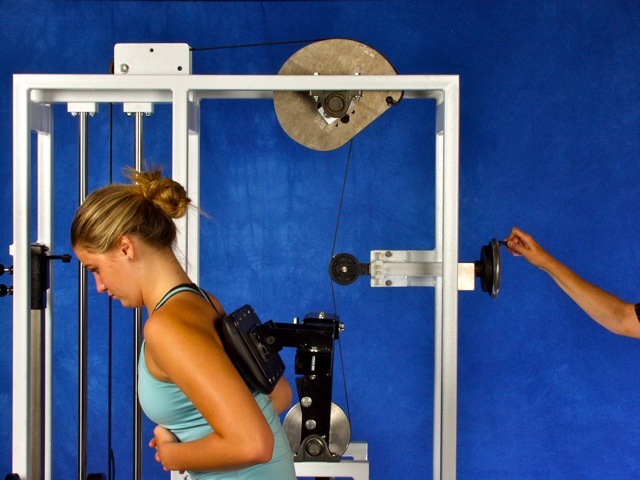 Every aspect of the restraint system works in synergy to promote better performance of the exercise. When combined with the Renaissance Exercise protocol, the subject can partake in a movement pattern that feels incredibly productive, safe and exhilarating. A comfortable, adjustable-height thigh support is placed under the proximal thighs to permit full hip extension concurrent with spine extension, and a seatbelt arrests reactionary forces at the hip angle in such a way as to not delimit extension. Note the conspicuous absence of a pelvic buttress as in the Nautilus Lower Back machine or a cylindrical pelvic pad as in the MedX Lumbar. Similarly note the absence of a clamping thigh pad. Such deletions contribute greatly to the ample freedom that a subject experiences in the RenEx Trunk Extension machine. 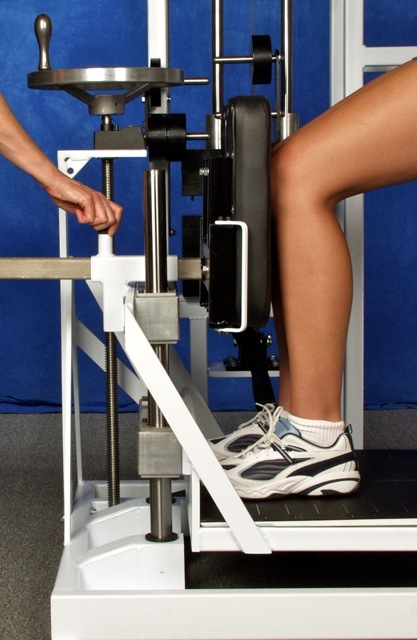 Toward the bow of the machine is the prominent lower leg complex of restraint and adjustment. The heart of the array is a vertically adjustable pedestal deck that articulates using a large hand-wheel. This ingeniously cantilevered design permits adequate access and safe entry/exit while simultaneously enabling precise and accurate positioning and repositioning—within 1/50 of an inch—without the subject being required to step higher than 3.5 inches. Its brilliant design utilizes components and force to lift and hold the largest subject plus the force of effort against the movement arm. Incorporated into the pedestal deck is the innovative heel wedge, which places the ankles into maximum extension. This accurately and precisely ensures repeatability utilizing etched grids between the aluminum wedge and the pedestal. Positioning into maximum ankle position cleverly solves two problems at once: First, it prevents the subject from rising off the heels as the ankles are already run out as high as possible with depleted height potential. And second, maximum ankle extension locks the talus against the lower tibia and fibula in the ankle to preclude knee straightening as the proximal thigh is held downward by the seat belt. As an added bonus the wedge conveniently flips back to retract out of the way for easier entry/exit. For special populations who cannot tolerate heel elevation, a calf restraint serves to optionally prevent leg straightening. 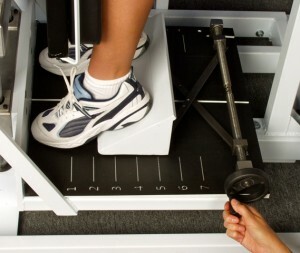 In comparison, Medx approaches heel-raising issues with a thigh constraint that forces the heels down onto the pedestal and approaches the leg-straightening issue with an adjustable pressure against the tibial tuberosities that transmits through the femurs and pelvis to blunt the posterior movement of the buttocks. While effective at blocking both of the unintended actions, note that the constraints do not curtail the subject’s inappropriate volition (the efforts to raise the heels and straighten the legs) but merely blunts the movement that is powered by the volition. 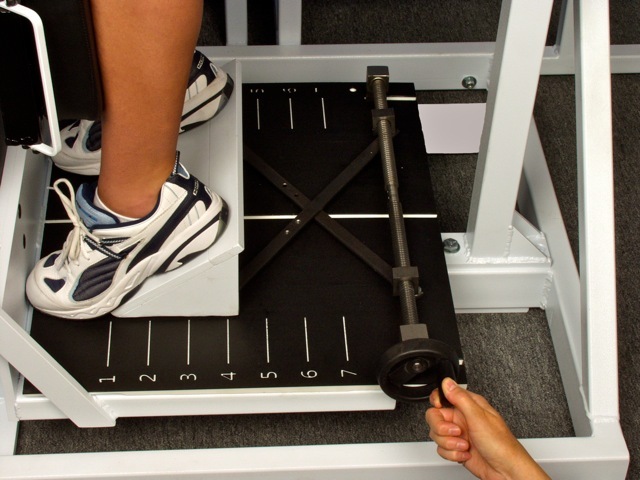 Additionally with the RenEx Trunk Extension machine, both the user and the instructor benefit from the ergonomic positioning apparatus. The user experiences a greater overall comfort and the instructor can quickly, easily, and precisely take the necessary steps for accurate prescription of the appropriate settings. 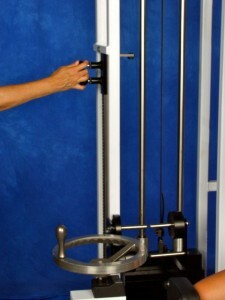 Of course, once the subject is properly positioned, resistance can be masterfully delivered upon loading via the patented Ultraglide® top plate and Freedom Stack® for near-frictionless weight- stack operation, complete with a self-aligning tuner for repeatable performance on every single repetition. And integrally-mounted incremental add-on weights mean quicker resistance selections by the instructor for ultimate efficiency in machine setup. As a dynamic exercise and rehabilitation machine, the RenEx Trunk Extension is in a class of its own, but it doesn’t end there. Optionally, the machine also possesses force measurement capabilities to facilitate real-time feedback in startup loading, end-point isometric techniques and fully- recordable and comparable performance of Timed Static Contraction (TSC) exercise. It should be noted that while isometric exercise is very valuable for many patients, including those who experience pain with movement, the traditional approach to isometrics has been a contraction duration that is too short and too violent due to abrupt application. Our isometric techniques bear no resemblance to the static tests used to plot strength curves. The TSC protocol by Renaissance Exercise stages the subject’s effort over longer durations to provide infinitely safer, more intense, and more productive exercise for any subject, weak or strong. The all-new RenEx Trunk Extension machine reflects a clarity of vision that defies preconceptions of anatomical function and reconstructs the idea of how to safely and effectively strengthen the human spine. It is a blend of elegant design, intuitive mechanics, and innovative thinking. Whether your goal is to engage in pure exercise with limitless intensity or to attend to the most delicate and sensitive cases for back pain or debility, the RenEx Trunk Extension machine by Renaissance Exercise Equipment, Ltd. is the solution. I have to say that I really like the look of these new machines! Maybe someone could put a bunch of them into the back of a huge tractor trailer like they do with traveling shows at state fairs and such and drive around the US ( and especially Virginia, ha ha) to show off these machines?? Great job on this important machine. THANK YOU! I’ll forward your compliment to Ken. As a person who has both a retro-fitted Nautilus Lower back machine (foot pedestal … bearings replacement) and a MedX exercise extension machine I can appreciate how this new Trunk Extension machine solves the problems with both machines. If this doesn’t get everyone excited about the new line of RenEx equipment I have no idea what would. “Game changer” couldn’t be more appropriate. Without any question: you guys define the “new hit standard” today, pushing the concept to whole new grounds IMHO. When writing history Jones (1970), Mentzer HD 2 (1995), McGuff UE (1997) and now you guys will be milestones in HIT community. Well, well, well. Lookee what we have here. I’ve been wondering what the latest and greatest Trunk Extension idea(s) would be, now that the previous ones have been built and tried. Quite the buggy. I run into that “heel-lift” problem all the time, and just have to tell people to stop the exercise if they can’t keep their heels down. The front tibial padding is similar to something I did years ago, with a padded tube across the shins, to serve as a reminder to not go any farther forward, but Greg Anderson and Ken both felt that something behind the knees would have been better. I now have that, and it prevents leg straightening. Perhaps with this heel wedge on the RenEx, the leg straightening is no longer a problem, and won’t require something behind the knees. Regarding hyperextension, to review, Ken said that it could be defined four ways: as any position behind anatomical neutral (zero), the maximally extended position attained via muscular contraction, an extended position beyond that attainable through muscular contraction, and, finally, the exercise movement of the same name. Anyway, some of you who are on the HITP e-mail list may remember what I wrote about this, saying that, if hyperextension is considered to be a detrimental position, then we cannot move into it of our own accord. It doesn’t make sense that the body would allow itself to move into an injurious position. For example, once you fully straighten your elbow, you can’t go any farther, no matter how hard you contract your triceps, and you don’t end up getting hurt. But if someone or something were to try to take your arm farther than you can go through muscular contraction, then you could get hurt. It requires an outside force to do it, though. This is why hyperextension of the spine during this type of exercise is not a problem, because you can’t go too far of your own accord. The foregoing assumes normality in the muscular and spinal structure, as some people may encounter problems moving through a normal range of motion. Regardless, it’s great to see this incorporation into this machine. As an aside, it appears that the trunk’s center of gravity shifts when extended past a certain point, that one where spinal extension continues beyond hip extension, and the relationship of the trunk to the movement arm changes. If so, it appears to me that a body-torque counter-balance might not be able to contend with that. Is there one on this device? •	The RenEx Trunk Extension possesses the bodytorque counterweighting for the trunk, upper extremities, and head of a small adult female. Since this is often the smallest and weakest subject to use this machine, a counterweight for her is most required. It is most accurate for her. And if it is not perfect for her, it is of negligible concern in comparison to the weight she can counterforce in the exercise excursion. Of course, as she becomes stronger and able to use more weight, her bodytorque becomes a yet smaller part of the whole. It becomes a minutely fractional concern—like the “g” in the word, “gnat” as in “a mere gnat on an elephant.” —not heard. •	This small female—rather than a small male—was chosen as the model subject for determining the counterweight also for the reason that a female possesses less mass in her upper trunk per her stature than her male counterpart. To put into our design, we desired the minimum counterweighting and she fits the requirement. •	The same issue for the small female exists with a larger subject. And counterweighting for her will serve to offset most of the issue with the larger subject, which becomes a yet smaller part of the whole as he is stronger and able to use more weight. •	A variable counterweight could be added to this machine, but it would double the cost of the machine and questionably serve to improve it negligibly for some subjects and none for most. •	Arthur Jones used the same design principle in the Nautilus Plate-loading Pullover machine. It did not include a foot pedal to drive the movement arm forward for entry/exit. 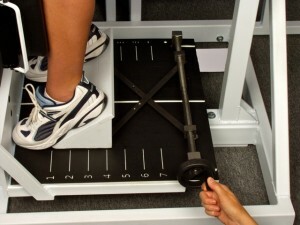 Instead, it utilized a foot pedal to lift the weight basket, which did not drive forward the movement arm. The movement arm fell forward because it was deliberately eccentrically weighted, not counterbalanced. This eccentricity caused a minute resistance-curve distortion for extremely weak subjects, but became a smaller part of the whole as heavier weights were added. •	Precise bodytorque counterweighting—demanding a variable counterweight—is required in static testing equipment—a practice we disapprove of and wish to avoid. This is NOT a MedX machine and it operates differently. In our machine, we don’t flex nearly as far forward as any other machine and so our counterbalancing issues are more for the extension part of the exercise. Also, the way the cam works supports not only the protocol but also the mechanics of the movement. People WILL cite the counterweighing issue over and over because Medx has effectively brainwashed everyone. Josh … what’s the weight amount on the bodytorque counterwight? Is it around 22 pounds like the retro=fitted nautilus Lower back machines that Ken use to do? Marc … did you ever covert your lower back machine to belts or is it still using chains? Does this machine exercises the the hip muscles as well as those of the lumbar and thoracic spine? Will it exercise the multifidus as thoroughly as the Medx medical machine, even with the hips unrestrained, or is that not the point? I guess the spinal muscles would be the weak link anyway and exhaust before the muscles of the hips. I’m not sure if the question has been asked elsewhere, and I apologize if it has, and also apologize if you’re not willing to answer at this point. My question is, do you have a rough idea of the unit cost on these machines. I’d be very interested in aspiring to equip my own facility with them, and was very excited to see something superior to the old SuperSlow machines being reintroduced. Further, will RenEx be offering certification in the machines use? YES! and the work is intended to be inclusive of even more musculature. Price quotes are available by appointment only. Yes…education is a MUST, all customers are required to take a machine operator seminar and are encouraged to further their education with a formal certification course. I believe this IS our responsibility. A exciting announcement is coming soon regarding the unveiling of the machines to the public. As usual, I’m extremely impressed by the function and execution of your machines. There is an infinite number of lower back pain sufferers that are NOT being exposed to optimal resistance exercise and waist time with garbage machines or “water” exercises that are useless or even aggravate their symptoms. Indeed, most of the medical and rehab community is ignorant about the true importance of strengthening the musculature as the only effective method to help/eliminate the majority of lower back pain. The more I look at the pictures of these machines the more I’m impressed with them. It’s good to know that since Nautilus and MED-X stopped producing anything really good any more at least Hutchins is still trying to make a better machine! Does Hutchins put out a catalog? Not that I will ever be able to afford one but I’d like to see a catalog of his most recent machines just to dream about them like I did Nautilus. These machines are mechanical masterpieces…and remember there was NO consideration for aesthetic appeal, every design feature and appearance is based on pure function. These things are liked stripped down drag cars. I also want to remind people that as unique as these machines are…in many cases we’ve been using early versions, with great results, for well over 10 years. The features on these machines are based on experiences of the entire RENEX team. The current catalog is represented with the blog posts here on; Compound Row, Ventral Torso, Pull Down, Overhead Press, Leg Press (Squat, Calf Exercise) and Trunk Extension. There are 22 machines in total. The blog posts represent our “Generic line” of machines. Yes, form follows function is the only way to go, they don’t need hub caps! I’m looking forward to learning more from RenX in the near future and eagerly await the unveiling of your knowledge and technology. From the glimpse here, I see a world of opportunity in Corporate Wellness and beyond. THANK YOU 🙂 There is a TON of R&D behind the RenEx technology, I can’t wait to show people how far this has come. I’ve worked regularly on 2 types of MedXLumbarExtension machines, I have great hopes for RenEx to become available in Chicago. 1/The unwanted weight-handling assistance of muscles other than those of the lumbar spine might be effectively “locked out” on MedX, but the tension pressing against those locks is a major distraction & possibly the cause of a too-early false-failure. 2/I have the strong impression that when I contract/extend/arch -all- of my back , the lumbar contraction is stronger. MedX support prevents this. The factors you bring up were strong motivators in the design of the trunk ext. I have the MedX medical Lumbar and the DAVID LTD medical lumbar in my studio…there is no want or need to use these since we got the RenEx Trunk Extension. Every single piece is this line was built based on the frustrations we’ve had with existing pieces…..often pieces that were very good by orthodox standards, but just not all of the way there. Update: As I now approach the MedX LmEx’s entire weight-stack, the pressure of the lap belt’s unbearable, (even with a pad provided for this problem). Thus, I do LE’s with no belt. I hope it somewhat resembles a ReEx TrEx, but I know better. Please come to Chicago! – You mention Ken Hutchins’ seminal paper on back hyper-extension. Is this available to read somewhere on the web? – How does the function of this machine compare to the earlier linear spine machines? Please send brochure and prices for your machines. Thanks. price list is by appointment only…please email me at joshuatrentine@yahoo.com so we can arrange a call. note i will not sell the equipment unless the buyer has tried it and signed up for education. Absolutely ingenious. Finally somebody is following forward in Arthur’s footsteps. Im sure he would be proud of the work you guys are doing here.